Ladder line fed loops perform well. I’ve been using large multi-band ladder line fed loop antennas with good success for many years. Having just one antenna that works reasonably well on all bands has been especially beneficial to our “nomad” lifestyle of frequently relocating. Moreover, not being a competitive ham, I’ve learned to operate effectively without a tower and rotatable beam antennas. Two element wire arrays work even better. 40 meters has become my favorite band especially since foreign broadcast has vacated below 7.2 MHz. I often hear hams on 40 meters using home brew arrays of one form or the other to great advantage. Why not feed a wire array with ladder line? 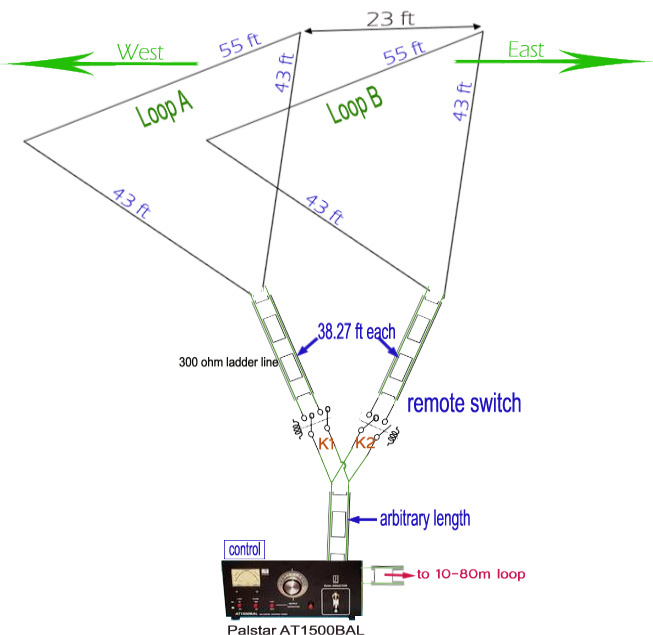 Most 40 meter array designs are fed with coax. Very little information about feeding these arrays with ladder line exists on the internet. So, I decided to find out first hand if this has any merit. More specifically, I decided to determine the viability of a two element 40 meter delta loop parasitic array fed entirely with 300 ohm ladder line. My Objectives. To keep everything simple and foolproof, optimize the array’s performance East/West on 40 meters, feed the array with 300 ohm feed line throughout and evaluate the array’s performance on other HF bands (except 160 meters) albeit at perhaps marginal effectiveness. Note: This project includes relocating the existing multi-band 450 ohm ladder line fed delta loop for use on other bands and to serve as a reference antenna for evaluating the loop array. (2) 300 ohm ladder line instead of 450 ohm for lighter weight and smaller profile. (3) Two full wave 40 meter loops of equal length spaced 23 ft apart on an East/West axis. (4) Both loops fed with equal lengths of 300 ohm feed line from a remote switch box. These feed lines serve a dual purpose… First, as a feed line for the driven element… Secondly as an “open” phasing line for the opposite loop to achieve the desired inductive reactance of 120 ohms at the feed point to make it electrically appear 5 pct longer to act as a reflector. A length of 38.27 ft for each feed line was computed with the http://www.qsl.net/aa3rl/tlcalc1.html as per the screen shot below. Q. Where will a +j120 ohms occur on the Smith Chart? Q. How far away from this point is a short circuited line? Q. How far away is from this point is an open circuited line? A. 0.25 wavelengths plus 0.065 wavelengths, or a total of 0.315 wavelengths. space at the design frequency. Q. So what is that in the feed line? Q. So how long should our open ended stub be? The above plot was computed with EZNEC by W4VR “Ron” who concludes that the loop should function well bi-directionally on 40 meters. With each loop fed in phase, performance on the other bands (not including 160 meters) is expected to be marginal. Whenever this proves unacceptable, the “fallback” scheme will be to operate on a separate loop antenna similarly to the one described at http://www.k4qky.com/antennas/loop.html . To make room for the array, I first relocated t the original 10-80 450 ohm ladder line fed delta loop to the South over the end of the pond as shown below. I continued to use it on bands other than 40 meters. More importantly, it served as a reference antenna for evaluating the loop array. Switching between the loop array and the reference loop is accomplished by the use of 2 SPDT knife switches in the shack. Decided to position the new array in the location shown above. I decided to use four suitable lengths of black dacron halyard to suspend the top two legs of the array between trees at a height of about 50 ft. The relative position of the 300 ohm feed line and relay system is shown in blue. Note that the array faces nearly West – East. Laid out the antenna wire and 300 ohm feed line in the front driveway. Cut two equal 141 ft length of antenna wire for each loop and two equal 38.24 ft lengths of 300 ohm ladder line for each feed/phasing line. Connected an egg insulator between each end of the loop at the feed point. Positioned (with a slingshot) dacron halyards between the tops of four trees to make ready for hoisting each loop of the array. Attached loop A and loop B to their respective halyards. Raised them both about 6 ft off the ground. Connected a 23 ft length of lightweight dacron line between the top corners of each loop in order to maintain the prescribed separation. Also, connected 38.27 ft of 300 ohm ladder line to the feed point of each delta loop element as shown below. Raised each loop to a final height of about 55 ft above the ground as shown below. Constructed a remote control switch box consisting of a waterproof ungrounded plastic box containing two simple open frame DPST 12 volt relays as shown below. It should be noted that the box is mounted to a 25 ft tall maple tree positioned at the center of the array. Constructed a control switch box in the shack as shown below. This switch box serves to activate each DPST relay in the remote switch box. It consists of two simple 12 volt SPST rocker style switches which remotely control the array as follows: Switch “W” turns on/off remote relay K1 and Switch “E” turns on/off remote relay K2 thereby controlling the favored direction of the array. For example, to beamWest, relay K1 is closed to the driven element and relay K2 is open to the reflector element. To feed both loops simultaneously (in phase), both switches are turned on. To disconnect from both loops, both switches are turned off. A suitable length of 300 ohm ladder line and control cable for the arrays remote switch enters the ham shack as shown below. Both 450 and 300 ohm feed lines are routed the Palstar balanced line tuner in the shack. Each feed line includes an inline knife switch to select the active antenna. Construction of the array was completed 02/09/2011. Settings for the Palstar AT1500BAL balanced line tuner were determined and recorded for quick reference. The shack switch box performed well in controlling the array’s remote switch box. The open frame relays housed in the remote switch box are durable and reliable. Initial impressions of the array’s performance on 40 meters are favorable. > East vs West front to back on is typically 10-15 db. DX performance to Europe is especially noteworthy. Moreover, background noise is often significantly reduced. > Rejection off the side of the array is typically 8 – 10 db. > Feeding both elements in phase results in largely omnidirectional performance but down typically 10 db from beaming East or West. > Performance on other bands when feeding both loops in phase is acceptable but typically down 8 – 12 db from the 10-80 meter multi-band loop. > The 40 meter array is fun to use and is a worthwhile antenna on 40 meters especially for DX. Feeding it entirely with 300 ohms works very well and certainly provides a much lower profile with the fringe benefit of permitting the array to be used on other bands albeit at reduced effective over a large ladder line fed loop. Decided to retire the array 03/18/2011. Being primarily a “rag chewer” on 40 meters, I often talk to several hams at the same time. The array often proved to be a burden especially when one ham is somewhere East and the another is West. I might well feel differently if I lived on either coast or was primarily a DXer. I have used large ladder line fed loop antennas for years including the one I use now as described at http://www.k4qky.com/amateur-radio/antennas/multi-band-loop.html . They certainly are not directional but make up for it in so many other ways. I’m not at all disappointed in having built the 40 meter wire array described here. It was a great learning experience which made it entirely worthwhile for me and perhaps others who may be contemplating a two element delta loop array. They really do work well!